Lamins do not appear to be universally distributed among different cell and tissue types. ab20740 recognizes the karyoskeleton, i.e. the intermediate filament proteins of the nucleus. Reacts with Lamin isotypes of Mr 60-75 kDa (LA, LI, LII, LIII, B1, B2, C). Other cell/tissue types have not been tested. 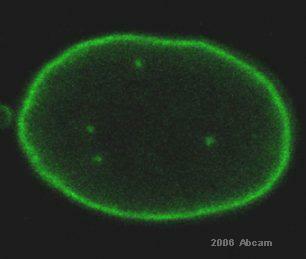 cell preparation: Nuclear pore complex-lamina fraction of Xenopus laevis (XLKE-A6 cells). Our Abpromise guarantee covers the use of ab20740 in the following tested applications. ICC/IF: Used at a dilution of 1/50 for 16 hrs (see Abreview for further information). WB: Use at an assay dependent dilution. Predicted molecular weight: 60-75 kDa. Dilution optimised using Chromogenic detection. Not yet tested in other applications. Optimal dilutions/concentrations should be determined by the end user. 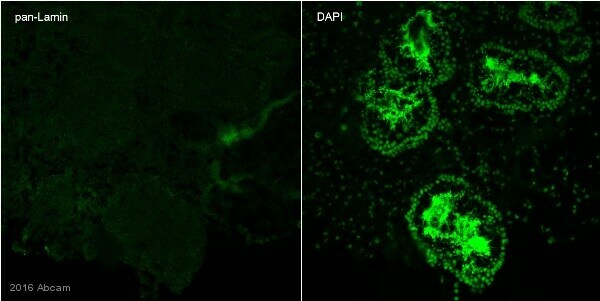 ab20740 at a 1/50 dilution staining human U2 OS cells by Immunocytochemistry/Immunofluorescence. The cells were Paraformaldehyde fixed and incubated with the antibody for 16 hours. Bound antibody was detected using an Alexa- Fluor ® 488 conjugated goat anti-mouse IgG. The antibody was found to stain equally well when used at a dilution of 1/250. This image is courtesy of an Abreview submitted by Chi Tang on 6 April 2006.
ab20740 staining pan Lamin in HeLa cells by Immunocytochemistry/ Immunofluorescence. Left image shows pan Lamin. Right image shows overlay of pan lamin (green), tubulin (red) and DNA (blue). Publishing research using ab20740? Please let us know so that we can cite the reference in this datasheet. Will this antibody cross-react with Lamin C? What samples were used to test this antibody in Western blotting? Thank you for your enquiry and patience. This product is a mixture of 3 clones [X67, X167, X233] and two of the clones, X67 and X167, do react with Lamin C. I'm not able to obtain information at this time on exactly what samples were used to test this antibody. Please contact us again if you have any additional questions. Thank you for contacting me regarding the problems that you have experienced using this Ab. Where an Ab is giving non specific staining I would suggest decreasing the concentration at which the primary Ab is used at from 1/50 to 1/100 rather than using the Ab at the higher concentration of ½ and undiluted, the reviewer mentions that using a concentration of 1/250 has been observed to give the same results. I would also advise that you use saponin as a permeabalization reagent (5-10ug/ml) rather than Triton X-100. Triton-X 100 will destroy cellular membranes since the target is located in the nuclear membrane this may be what is resulting in non specific binding, releasing antigen into the cytoplasm. Saponin is a detergent that permeabalizes the cell membrane of eukaryotic cell membranes by interacting with cholesterol and is more gentle than Triton-X. Where membranes are not over treated with saponin they have the ability to reform. In addition to this the percentage of blocking reagent may be increased to 5% BSA this will also act to reduce the observed background staining. Please do not hesitate to get back in touch with me should you still experience problems. Do you have information about the epitope recognized by this antibody. Thank you for your enquiry. This product is a mixture of 3 monoclonal antibodies, Clones X67, X167, and X223. The specific epitope locations have not been determined. The reactivity to lamin isotypes in different species for each clone is listed on the datasheet. Please contact us again if you require further assistance.